designs are nice. prints are perfect for all festive occasions. Highly recommended. Great pick. Don't miss this superb combo available at such an affordable price. Loved its designs and prints. I can now flaunt myself on all festive occassions. Saved my time and money when looking for my sister's wedding clothing. I was very much satisfied with the quality. Amazing deal. 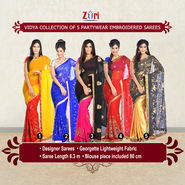 Highly recommended for partywear collection.